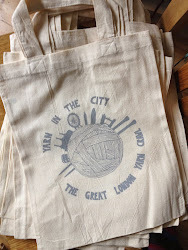 Yarn in the City: The Great London Yarn Crawl: Another GLYC Update!! Quick reminder that this is the final week to get your tickets to the inaugural Great London Yarn Crawl! Registration closes on Saturday, 7 September at midnight! Two-thirds of the event's tickets are already gone - with half of our routes pretty much sold out. Each of the Green, Orange, and Purple routes only have one ticket left on each! Luckily, the Blue and Red routes are still only half full and there's lots of room on the Yellow route. If you're thinking about joining us "at the last minute", you'll miss out! We've got a lot to organise once ticket sales are done (hello, goody bags! ), so once registration closes, that's it!